ClaroLux’s LED lighting fixtures were recently chosen in the LEED project at The Proximity Hotel and Print Bistro in Greensboro, NC. Built to use 40% less energy and 30% less water than a comparable hotel, the AAA Four Diamond, locally-owned Proximity Hotel in Greensboro, North Carolina, offers a glimpse of the future while celebrating the past. Sustainable practices, custom-designed furnishings, commissioned art and innovative design await guests in every corner of the 147-room luxury hotel and its adjacent restaurant, Print Works Bistro. 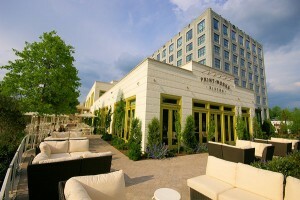 Proximity Hotel’s green sustainable design and construction follows the guidelines of the U.S. Green Building Council’s Leadership in Energy and Environmental Design (LEED) Green Building Rating System,™ the nationally accepted benchmark for the design, construction and operation of high performance green buildings. 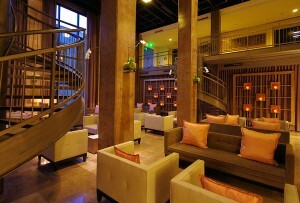 Both Proximity Hotel and Print Works Bistro attained the USGBC’s highest rating, LEED Platinum. Proximity features ultra efficient materials and the latest in building technology such as North America’s first installation of the regenerative drive for Otis’ Gen2 elevator, which reduces net energy usage by capturing the system’s energy and feeds it back into the building’s internal electrical grid. In addition, 100 solar panels on the roof generate energy to heat water. More. While many of the 70+ energy and health enhancements are not outwardly visible to guests, folks are sure to notice the oversized windows providing abundant natural light and great amounts of fresh air in their guestroom. Guests also enjoy flavorful food, elegant lighting (indoor and out),custom-designed furniture and original artwork in each room. As guests enter the hotel, they encounter interesting architecture and décor including a “floating” front desk made of a striking 12-foot steel cantilever sculpture, a 28-foot long mohair sofa, an interior balcony overlooking the Social Lobby and 22-foot high windows overlooking the Bluebell Garden. The hotel features 7,000 square feet of private event space, a spacious fitness studio, outdoor swimming pool, and a “guest living room” on each floor. Proximity’s oversized guest rooms and suites have 50 square-foot windows, custom furnishings, high definition television, Magi beds and signature bathrooms. Proximity’s restaurant, Print Works Bistro, uses fresh, local food in creating both traditional and modern versions of classic European bistro dishes. With three walls of windows overlooking the gardens in the dining room, no seat is far from any one of the 52 seven-foot tall operable windows. In addition to an extensive wine list, Print Works offers a friendly bar and plenty of outdoor terrace dining by the restored stream. Sustainable practices there include sensor-controlled ventilation for the kitchen, geothermal energy for the restaurant’s refrigeration equipment and tabletops made of reclaimed walnut. The Hotel and Bistro are simply works of art that are a must see!! !